And a Pompey Hollow Book Club Seance with Sherlock! The British have landed...again! In this heartfelt coming of age story, Ole Charlie, the club's Guardian Angel since the Book of Charlie narrates another adventure. This one with an international twist. 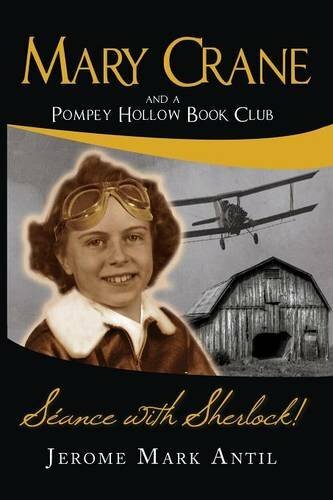 The Pompey Hollow Book Club novels are lighthearted nostalgia about growing up in the heart and the shadows of WWII. The club started when they were all nine, just after the War - and, truth be known, it had little to do with books. The name was a convenience to their club of valor, enabling them to get out of the house for club meetings - even on school nights. Mary Crane has been the club president since 1949 - primarily because she could spell, and hit a home run. Now they are all teens. Antil takes pride in the historic detail of his backdrops - researching the War years and early 1950s rural America - times he grew up in. Many of the main characters are real. The adventures get taller with the telling but they have accurate roots in the times and foundations in truth. The War that killed seventy million people presented in an interesting way so as to encourage a better understanding among today's young adult - making a point we mustn't forget this War and its heroes. In this adventure - book three in the series - we find Mary Crane overseeing the club's volunteering to do the chores for poor old Farmer Parker's farm - watching over his team of horses and some milking cows - bringing the hay down into the barn while he's bedridden with a badly sprained back. In doing so a biplane giving State Fair plane rides goes off course and nearly crashes on his farm. Rushing to the pilot's rescue, the club members unwittingly step into their most spirited adventure yet - this time a need to out trick a professional pickpocket at the State Fair who happens to be in a traveling Sherlock Holmes Players company from England.